Over the past 6 months there's been something brewing at Duke ... something that we're now incredibly excited to share with the world. Do you detect a need? Thus, Autism & Beyond was born. 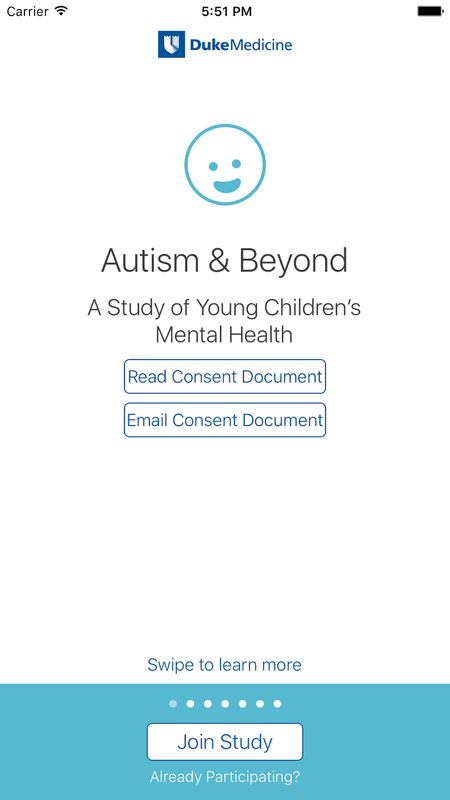 Autism & Beyond is an incredible new ResearchKit study that builds upon the groundbreaking work of Geri Dawson, Helen Egger and Guillermo Sapiro, who over the past several years have been working to refine novel video algorithms that can analyze and detect a child's emotion in real-time. They've been conducting studies at Duke clinics using an iPad prototype app for almost 2 years. In early 2014 I had the pleasure of working with Kathleen Campbell, a wonderful 2nd-year medical student on her inpatient Pediatrics clerkship. I was her attending physician at the time. Shortly thereafter, and knowing I had an interest in mobile technology, she gave me a demo of an app that the aforementioned team had put together. The idea and technology were amazing. I thought it was great work, although I really had nothing to add at the time. I looked forward to seeing the results of that research. Fast forward to March 2015, and the announcement of ResearchKit. It was clear that we needed to put this technology to the test, and quickly. We cast a wide net looking for "shovel-ready" projects, and of course, the autism app Kathleen showed me bubbled to the top. The project was already underway (with an iOS app no less! ), and had a great team that had already made significant strides in this area. It was an natural fit. It was also a remarkable coincidence that at this exact time within the Duke Institute for Health Innovation (DIHI) we had just hired two talented mobile developers, Mike Revoir and Jamie Daniel, who were (are) passionate about mobile technology, health, and research. They were so excited about the project that they were eager to dive in even before their first official day of work! As the scope of the project grew, so did the number of individuals and teams involved. In the end, it was a peerless example of cross-institutional collaboration across Duke University and the Health System. This project couldn't have happened without any of them. So what about the actual app? I could explain it in detail here, but seeing is believing, so go download it now! And if you want more info, check out the website. Even if you don't meet the eligibility criteria, we've made it simple to get a taste of the cool technology that's gone into it without ever signing up. 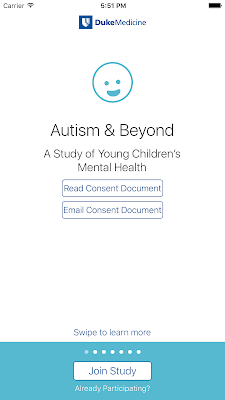 The app basically comes down to our need to know one thing: could we one day use a mobile phone to automate screening for conditions such as autism or anxiety? 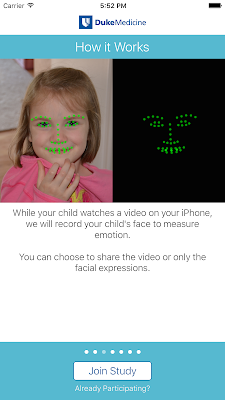 To start, we first need to know if it's even feasible to analyze facial expressions on such a small device. That's what this study is intended to determine: feasibility. As you can see from the screenshot above, the software algorithms developed by Guillermo and his team not only detect facial features, but also expressions, and can do so in real time. The data from this study will help to refine those algorithms. In addition to the facial recognition pieces, we've also included several critical questionnaires with the help of Helen and Geri. For example, we ask about temper tantrums and provide feedback to users regarding where their child falls compared to his/her peers. While the release of the app marks the end of one chapter (and a whole lotta work by our incredible team! ), it's clearly just the beginning. We hope that the app will have an impact in the US, but also plan to roll it out in China and South Africa soon. 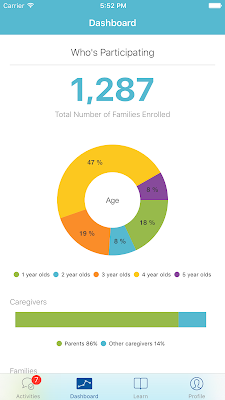 The more children we can reach, the more we can help. While ResearchKit allows us to reach millions, we still need to take care of one child at a time, and ensure that those children have access to the resources they'll ultimately need for full diagnosis and treatment. That's going to take even more teamwork!